The Kickstarter campaign has cleared the Kickstarter staff check. I plan to launch it at 6 PM PST on Friday, March 13th. There is only one remaining issue to deal with. Unpub uses assigned tables. Each designer has their own fixed table with their name on it. Protospiel uses open tables. Any table is open for any designer to use throughout the weekend. My assigned table at Unpub 5. I received several requests to do assigned tables. After a lot of thought and discussion with some of the designers who came last year, I don’t believe I can do assigned tables at Game Kaslte and have an event that is a good experience for everyone. Please allow me to provide some insight into my thought process. I want to build the board game community here in the bay area and am trying to balance a litany of competing interests. - You have a guaranteed spot to set up. - Players can return to find you easily with their friends if they want to play again. - You have your own personal space to manage with signs, promos, sell sheets and goodies. - Its convenient for designers. - We can’t run the game design contest. The contest needs to use 10 tables for 2+ hours. This is a major draw for some people and helps bring more play testers to the event. - All assigned tables could mean no panels for discussion. My plan is to close the smaller room (the arena) around 7 or 8 pm for the panels and leave the dungeon open. I already have people contacting me out of the blue asking about the panels. Panels are a major draw for many people. Panels help draw in more playtesters. - Isolation and the death of community. Assigned tables create isolation and prevent designers from playing each other’s games. Most designers would greatly benefit from playing each other’s games to get unfiltered and practical advice. The general public tends to be very polite with a lot of their feedback. A random sample of players off the street will not get the same level of feedback that you will get from other designers. You should play other designers games, and ask them to return the favor. - Table assignments, who gets what? Who gets the tables in the front? Who gets the tables in the back? Where/how do I move the loud party games to another table? Where/how do I move the games that have bloody zombie artwork that we need to keep away from children? How do I handle complaints about table position? - Not all designers come all three days. Last year lots of designers did not come Friday, or did not come Sunday. With assigned tables, their tables would be empty. - The number of designers that could come to the event would fall to 25 and/or there would be need another lower class of designer badges. To understand the designer limit, you need to understand Game Kastle’s table capacity. *Note that three of the tables in the Dungeon are standing tables meant for miniatures. Not idea for board games. We need to use 1 table for raffle prizes, 1 for food and 2 for the registration desk. That leaves 41 tables (including the three standing tables) for designers. The plan was to sell 35-40 designer badges (40 max). The idea would be that not all designers would be using a table 100% of the time. You should be playing other designer’s games at least some of the time. To further understand the difficulties assigned tables would cause, lets look at the tentative schedule. 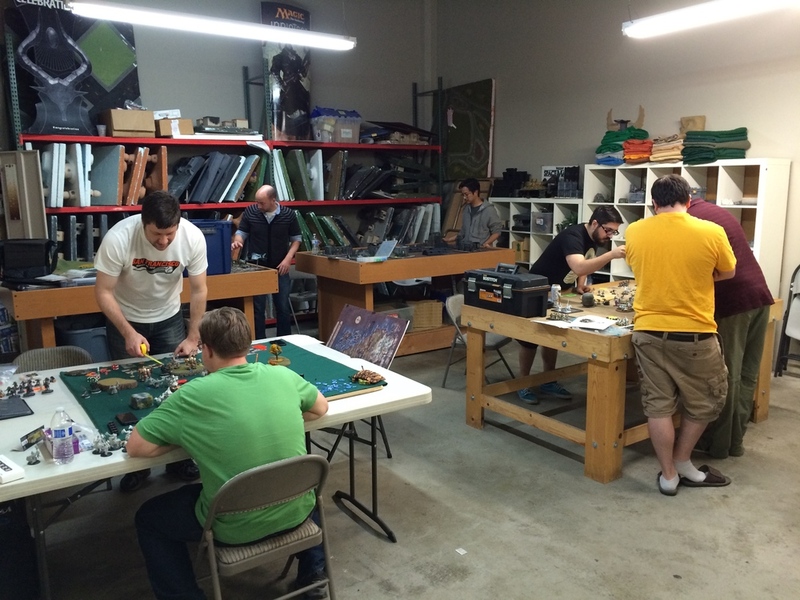 The panels and the game design contest will consume at least 10 tables for at least 6 hours. How would assigned tables work when 10 tables go away three times for hours at a time? Do I make first class and second class tables? So assigned, some open? That would be a nightmare to coordinate and manage. I don’t have enough help to pull that off. Looking to the future, this is likely the last time the event will fit at Game Kastle. Game Kastle has been fantastic and supportive, but if I want to grow the event I will need to move to a larger venue in the future. I’ve been getting quotes and pricing this out. Its going to cost several thousand dollars to get a hotel ballroom with enough tables, or space in a convention center. That means in the future I’m going to need to charge all designers at least $100, perhaps more. At that point we can move to an assigned table system. I am feeling a lot of pressure for assigned tables, so I am going propose a compromise. The 8 people at a sponsor level will get an assigned table in the Dungeon. That is the six meal sponsors at $150, the design contest sponsor (also $150) and the $500 Sponsor (if that gets a backer). If you really want an assigned table, you can pay $150-$500 and get one. If you pay $500 I will assign you any table you want in the Dungeon. After all, you are paying 10 times more than the average designer. All other designer levels will share the remaining 32+ tables. Is this a reasonable plan? I would love to hear your thoughts in the comments, or shoot me an email. - Game Kastle has 45 tables total (including the 3 standing tables). 45 - 1 food table, -1 raffle prizes table, - 2 registration tables, -8 assigned tables for sponsors = 33 tables. If we sell 40 designer badges (the max) - 8 sponsor level badges, there will be 32 designers sharing 33 tables. - Only designers can use tables at the event. If a person does not have a designer badge, they should not be using a table. Game Kastle has moved all others events off of that weekend. We bumped Magic, Pokemon and everyone else. No designer should be using more than one table at any given time. - Please be respectful with your stuff. Don't leave your bags/game items clogging up the walkways or other tables.